MRHFM employees geared up for participation in their fourth annual Pedal the Cause in St. Louis, Missouri. The two day event’s primary purpose is to raise money for cancer research. On Sunday, employees rode anywhere from 25 to 75 miles or on a stationary bike for a predetermined time, while others chose to donate their time by volunteering for the event. 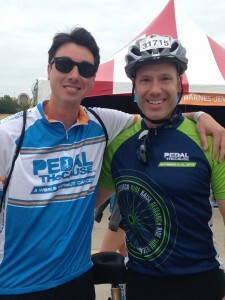 Together employees raised $18,000 in donations for Pedal the Cause. The MRHFM firm proudly supports events such as this to hopefully one day eradicate cancer. Jim Caruso and Michael Mudd; MRHFM employees participate in Pedal the Cause on September 26, 2015. Since 2010, Pedal the Cause has been raising money for cancer research through annual cycling events. Bill Koman, a two time cancer survivor, founded this charity with the intention of giving back to the institution that saved his life. Donations benefit Siteman Cancer Center and St. Louis Children’s Hospital for the purpose of cancer research. 100% of the funds raised are given to these two organizations. Pedal the cause has raised $9.36 million dollars, which has funded 56 cancer research projects. 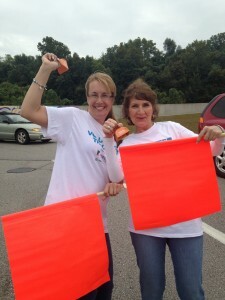 MRHFM employees cheer on their coworkers in Pedal the Cause. MRHFM exclusively handles mesothelioma cases, which is a rare, asbestos caused cancer that affects a membrane around the lungs, heart, or abdomen. Asbestos causes nearly 1 in every 3 occupational cancer deaths but research for these illnesses is grossly underfunded. Fund raising events, such as Pedal the Cause, help supply monetary support for research that would otherwise not be possible.